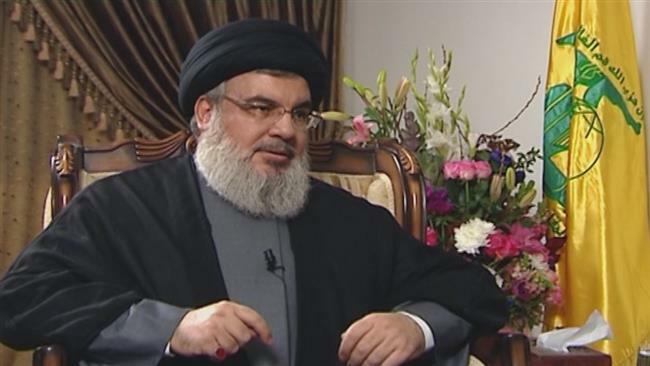 In a speech on Thursday, Hezbollah’s leader Sayyed Hassan Nasrallah vowed to turn Israel’s nuclear bomb threat on Israel itself. On the issue of ammonia – the ammonia storage tanks in Haifa. A few days ago an order was issued – that within ten days the ammonia storage facilities in Haifa must be removed. Okay, but why? Those tanks have been there for decades…Because the resistance spoke about these tanks and how they (practically form) a nuclear bomb (if targeted). 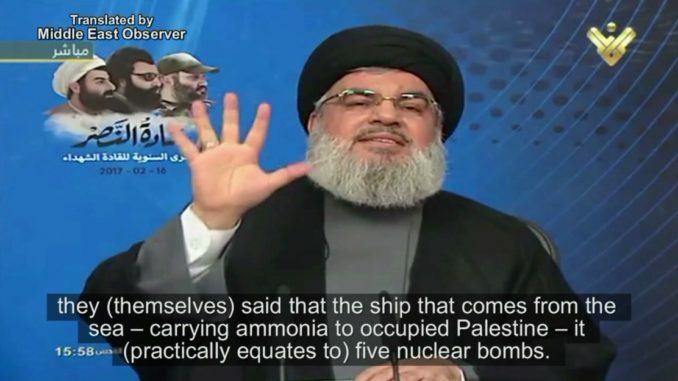 There are those that came to point out to us further, that there is a ship that delivers the ammonia, and hands it out to the Haifa storage facility and other (facilities) – if I had said regarding the ammonia storage facility that it (practically equates to) a nuclear bomb, they (themselves) said that the ship that comes from the sea – carrying ammonia to occupied Palestine – it (practically equates to) five nuclear bombs. Okay – how can this ship escape from us? Let’s assume they empty the storage facility in Haifa. Firstly, wherever they take these tanks of ammonia, we will reach them God willing. Of course in Haifa it is easier, without a doubt – it is closer and easier. However, wherever they take these tanks we will reach them. Okay (let’s assume) you hid the tanks, where will you hide the ship? Under which wave will you hide it? Today, on the anniversary of (the martyrdom of) the ‘leaders of victory’, I call on the Israeli enemy to not only empty the ammonia storage facility in Haifa, but also to shut down the Dimona nuclear reactor – to shut down the Dimona nuclear reactor. They have sufficient information on this reactor, that it is old, run down, out of date, and it does not require a huge missile (strike), and they also know that if (our) missiles struck this reactor, (they know) what will happen to them, (they know) what will happen to them, and to their (occupying) entity, and (they know) the amount of danger that it carries towards them. As I said in the past regarding the ammonia storage facility, Israel has nuclear weapons, and it opposes Iran for (wanting) its peaceful nuclear program, however we – thanks to the Almighty God – and thanks to the minds and courage of our mujahideen (fighters), and through our own abilities, we are capable of transforming the threat into an opportunity. The Israeli nuclear weapons which pose a threat to the whole region – we are turning them into an opportunity. We are turning them into a threat to Israel, to its entity, to its settlers, to its colonialists, to its invaders, who occupy occupied Palestine. Some held that the Israeli decision to close down the ammonia storage facility in Haifa as a sign that war on Lebanon is nigh – it may be as such, (though) I don’t agree with this (opinion), while I don’t speak in absolutes and certainties, I say to those (with this opinion) that rather, it is an indication of the credibility that the resistance in Lebanon has (in the eyes) of the enemy. (It’s an indication) of the enemy’s certitude in the power and ability of the resistance in Lebanon, and that when (the resistance) says (something), it is capable of carrying out what it says. Look into this reading, before looking at others.